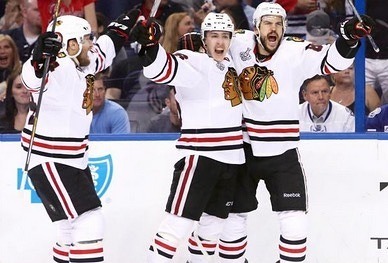 The Chicago Blackhawks 2-1 victory over the Tampa Bay Lightning in game 5 of the Stanley Cup Final to take a 3-2 series lead averaged a 3.82 overnight rating on NBC. That 3.82 rating was down from the 4.6 in last year’s game 5, but last year’s game 5 had several differences: it was on a Friday, the game had 2 overtimes and it was the deciding game of the series. Only 14.3 for a game 5 happening in your city. like what are other the 85% of people in the city doing at that time in Tampa? The 14.3 represents the % of homes with a TV not the % of people tuned in. So, it’s very likely more people actually tuned in to watch the game.